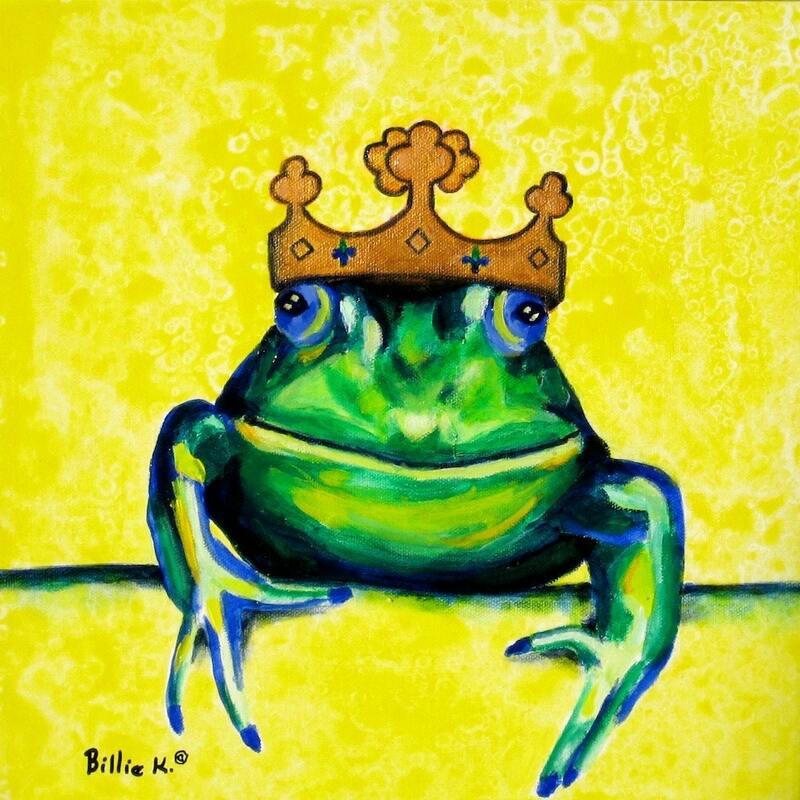 This vibrant green and yellow original children's room painting of a frog wearing a gold crown would be the perfect artwork for your child's fairytale/ princess themed bedroom or playroom. I created this crown based on crowns from the French Merovingian Dynasty. I could not find reference as to why the clover was used in their crowns - since clovers are traditionally thought of as Irish. However, I did find it interesting that one of the first Merovingian King's name was Clovis - and his crown had clovers on it. The Fleur de Lis is also a traditional french symbol of that time which has been traced back to Egypt, as a stylized iris. It is said to be the sign of nobility and also of the sacred feminine. PS - Did you know that in the original Grimm's Fairy Tale the princess didn't kiss the frog to make him appear as a man? She actually got so frustrated with the frog, she threw him against the wall and he turned back into a prince. This was later changed to the frog becoming a prince once she allowed the frog to sleep on her pillow. And then later changed for English audiences to the princess kissing the frog. This is a 12 x 12 original painting. It is gallery-wrapped canvas so there is no need to frame (if you don't want to). Great for small spaces, or buy a few to hang together. Original artwork is signed by the artist.